The signing ceremony took place at the Palace Museum on Oct 17. The signing ceremony for the setting up of the Palace Museum Art Gallery was held at the Hall of Embodied Treasures in the Palace Museum on Oct 17. The galley will be located in the Sanlihe area in Qianmen Dajie, in Dongcheng district, in Beijing, and cover an area of 8000 square meters. Shan Jixiang, the director of the Palace Museum, hopes the art gallery can offer colorful cultural experiences to the public. 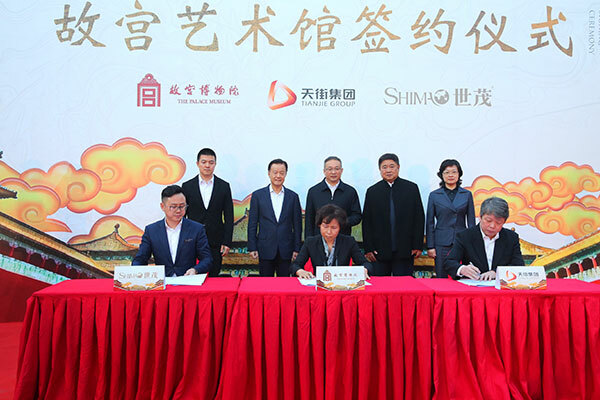 The Palace Museum, the Shimao Group, and the Tianjie Group signed a tripartite agreement at the ceremony, and will build the project together.